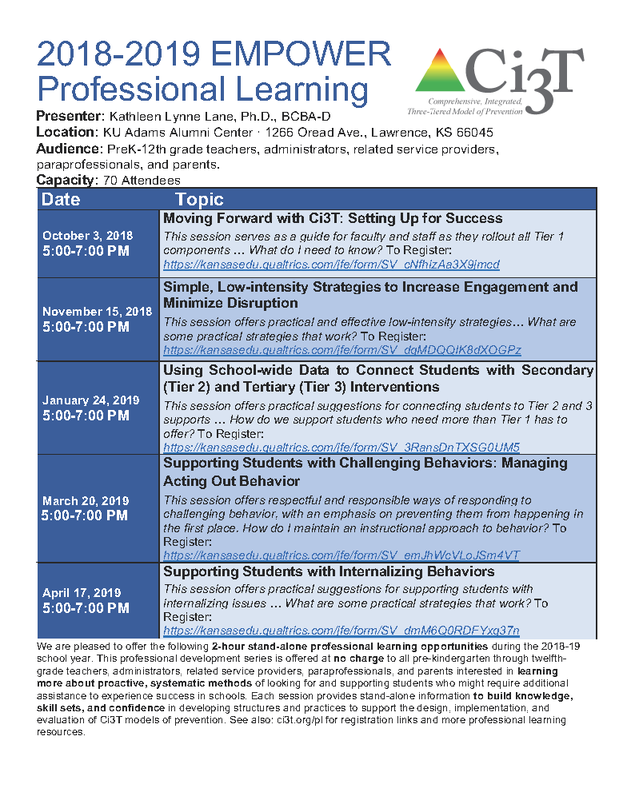 Learn more about professional learning opportunities in Kansas and Hawai`i below, plus Tier 2 and Tier 3 strategies and interventions can be explored by watching an introductory video (where available) and downloading supporting documents. EMPOWER Sessions now have space for 70 people! These five 2-hour stand-alone sessions will be held from 5:00-7:00 PM. Information and Registration: please click the links in the flyer. Information and Registration: please follow this link. 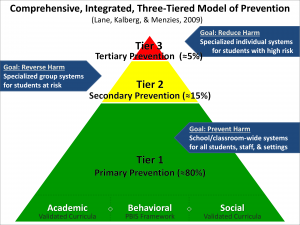 Learn more about Tier 2 and Tier 3 strategies and interventions below by watching an introductory video and downloading supporting documents. In these materials you will learn more about each strategy, why it is effective, the research supporting its use, and how to evaluate treatment integrity and social validity. Also included are PDFs and/ or Microsoft Word documents of what the intervention would look like as described in a school’s tiered intervention grid, research article references, practitioner article references, and more. Self Monitoring TRANSCRIPT Self-monitoring is a versatile intervention that can be used to address behavioral, social, or academic needs. In addition, it is relatively simple to implement. When teaching a student to improve self-monitoring, two processes must occur: observing and recording. The observation component requires that a student be able to determine whether a given behavior occurred. This requires that the student be very clear as to the exact definition of the required behavior. At the end of a given interval, the student must make a determination as to whether or not he or she was engaged during that entire period. 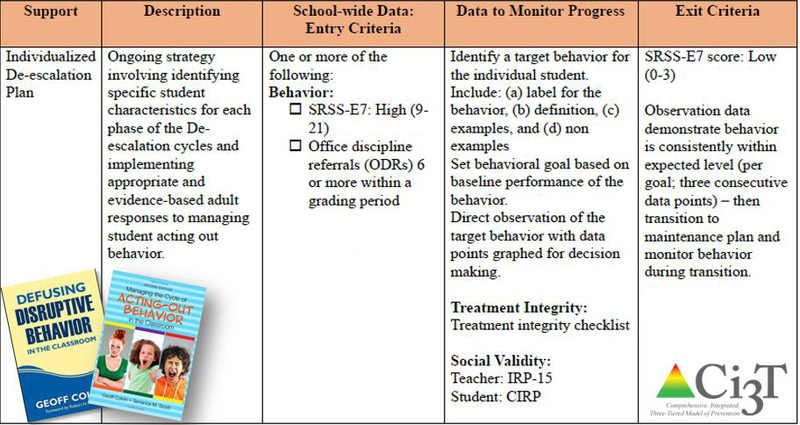 Then the student needs to record his or her behavior – the second process of self-monitoring. Some students may require an external reinforce that meets the function of the behavior. In brief, people engage in behaviors to either obtain or avoid attention, activity, or sensory experiences. However, for other students, the act of monitoring and recording their behavior is reinforcing enough to increase the future probability of the target behavior occurring. For more information and resources, such as assessments, unit plans, and mini-lessons, visit the Think SRSD website (http://www.thinksrsd.com/srsd/) or to view an IRIS Center module on SRSD click here or visit http://iris.peabody.vanderbilt.edu/module/srs/. For more information and examples of how to use this strategy, please see the following references: Colvin, G. (2010). Defusing disruptive behavior in the classroom. Thousand Oaks, CA: Corwin. Colvin, G., & Scott, T. (2015). Managing the cycle of acting-out behavior in the classroom (2nd Edition). Thousand Oaks, CA: Corwin.